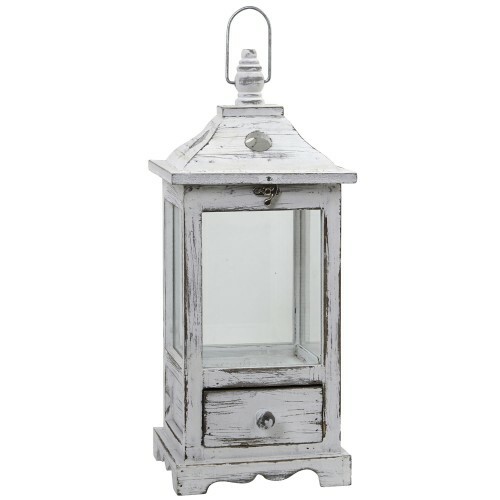 With a white paint finish and weathered wood, this lantern showcases a rustic, earthy look that is versatile for a number of different interior styles or events. Perfect your beach inspired tabletop with sand, sea glass and candles for a more coastal feel, or add moss and animal figurines for a springtime vignette. 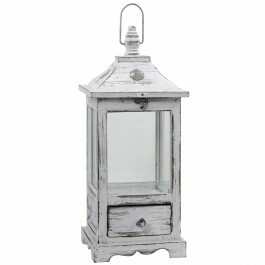 This lantern serves as a multifunctional piece, making it easy to reuse at holiday and wedding events. Lantern features one pull-out drawer and a metal hook for storage and hanging purposes.